A new and exciting way for trumpet players to learn and practice basic jazz style. 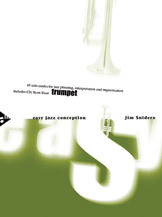 The Easy Jazz Conception: Trumpet Book & CD set features 15 solo etudes based on blues and standard chord progressions, demonstrated by Ryan Kisor on trumpet along with a world-class rhythm section: Mike LeDonne, piano; Peter Washington, bass; and Kenny Washington, drums. The recording features two separate versions of each etude: one with the soloist and rhythm section, and one with the rhythm section only. See and hear how the soloist phrases, play with or without the soloist on the CD, and learn basic jazz style first hand.